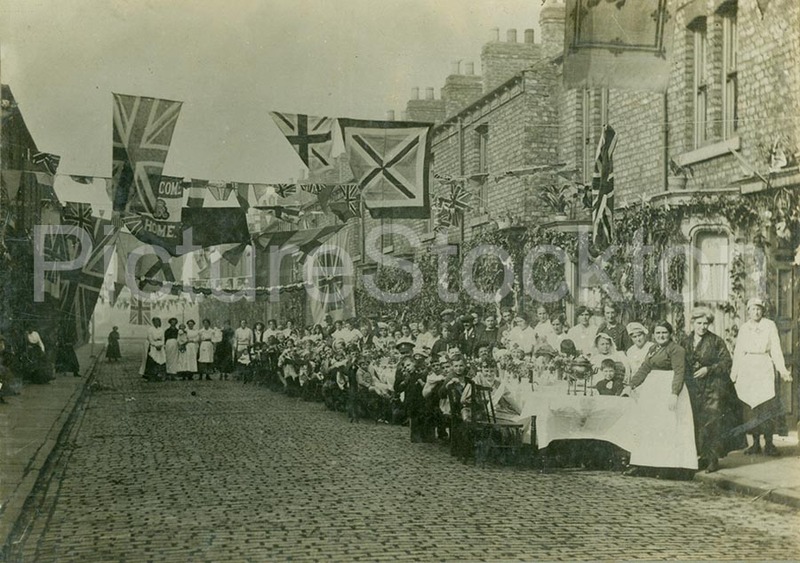 These photographs are of a street party held in Suffolk Street, Stockton in 1919, presumably to celebrate the end of World War One. The photographs are taken looking north – 11 Suffolk Street is on the right hand side. 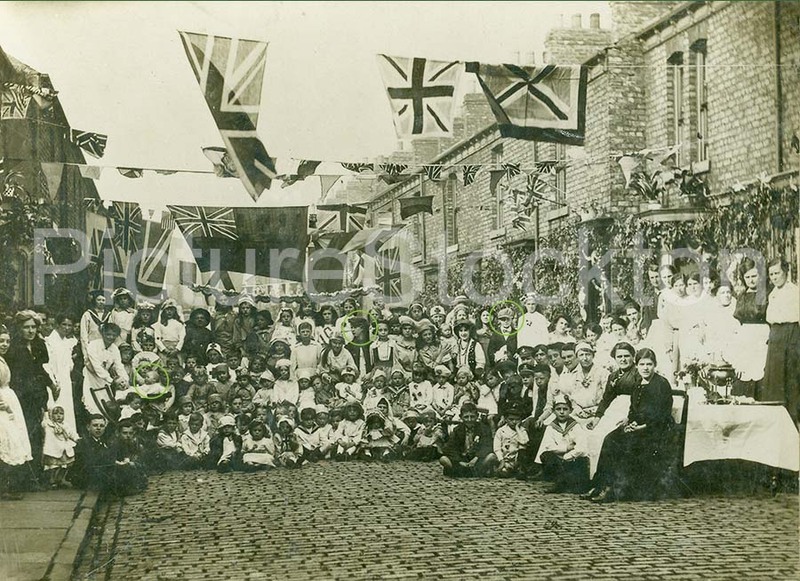 The people ringed in green are Norman and Edna the son and daughter of my Grandparents, Knaggs and Edith Sanderson, who had a shop at 60 Suffolk Street (now demolished). The baby in the right hand side of the pram is my later mother, Stella who would be about 6 – 9 months old when the photographs were taken. It is notable how few men there are in the photographs. Photographs and details couresty of John S Corney. I know my grandmother Ellen (Nellie) Harrison nee Jamieson lived on Suffolk Street as a child at the end of the 19th century and again in the 1960’s. I think she lived at no. 23. Has anyone any memories of this family? Hi Pollie; I wasn’t sure if it was you! The Pollie versus Pauline confused me; I do get confused easy these days! You say you have photos of Roseann and her sisters. My grandmother was her sister, Mary Jane Redican, who died of rheumatic fever at the age of 25 when my dad was 6. I have only one picture of MaryJane , that I can share with you, taken when she was about 16 I think. I also have a picture of their mother, Mary Anne Redican, nee Cox. I would like to see the pictures of Rosann and her sisters if you want to share them. If you don’t have my email address you can get it from Picture Stockton. I am doing very well and I hope you are. What a nice surprise to see these photo’s. I was born and raised on Suffolk St. # 39 , and my Grandpa and Grandpa (Kate and Richard Peacock) and family lived at #13. Every time I come back from California to visit the UK, I always take a drive down Suffolk St. and the only real change I see is the cobble street has been covered with Tar. I have never known how old the houses are in Suffolk St., ….Does anyone know the year they were built? Kevin, a map of Stockton dated 1889, shows most of Oxbridge built up. I suspect that SuffolK Street and Norfolk Street were built in the 1880s. Hello just seen your comment about your family name Peacock living in Suffolk Street,this is also my family name but we know very little about my grandfathers brothers or sisters only knowing the name of one brother who was called Joe. we know there was more boys and a few girls and that he was born in 1892 or there about in the west row area of Stockton and moved to Waverley Street on marriage and died in 1971, his name was George Henry Peacock and married Roseann Redican in St Cuthberts Church. Just wondering if you have any of this information on any records you may have. Thank you for reading, hope to hear from you soon. I can’t give you any information about your grandfather George Peacock’s direct family, but Roseann Peacock, nee Redican, was my great aunt on my father’s side. I knew ‘Uncle George’ and ‘Aunt Rosann’ quite well when I was a kid; they used to look after me during the summer holidays in their house in Waverley Street while my parents were working. The Evis family, Billy, Sydney, Brian and Susan, lived two doors from me in Ellicott Street. Jim McCurley, can you help me, my maternal great grandmother was Margaret McIntosh, her son John William McIntosh served with DLI 1904-1914, he was killed weeks after great war breaking out, it was only recently I discovered John William McIntosh had married 1912 to Milly Emily Peacock, they may have had a child born 1912 named John William McIntosh, would you know of any of this ancestry at all. Sorry Derek. The Peacocks in my ancestery were through marriage, so I know nothing about them.